We keep the bar low because we like positive reinforcement. This sounds like a big deal, but we’ve already lived in the place for almost a year, so it’s less of a big deal than you would imagine. All the really physically hard stuff (the moving, the driving around trying to figure out where you might want to live) has been done a long time. The mentally and financially hard stuff (I would not suggest buying a 156-acre off-grid property from an overseas buyer as a first real estate transaction) is just barely in the rear-view mirror. Okay, yes, you’re right, the financially hard stuff doesn’t really stop when you’re a homeowner, especially one with equines. The as-yet-unnamed ranch is 156 acres and not on the modern electric grid. We use solar power generated from panels that are almost as old as I am. There’s a back-up generator that we must run on what I consider too regular a basis; roughly every other day when the sun does not shine 100%. But the solar upgrade is not a first year priority because I already lived through one winter with outdoor animals and no ability to keep water from freezing – the system was not made to heat water buckets. So our first big project as ranch owners is buying and installing a Bar-Bar-A waterer. Is this overkill? You might think so. The things are not cheap, and the installation is a bear. But let me tell you about last winter. Sometime around Thanksgiving the temperatures dipped below freezing and they did not get above freezing again until February. Also around Thanksgiving the first snow fell, which was followed by the second, third, fourth…I lost track somewhere around tenth snow. We had a lot of snow. We had brutally cold temperatures. (The lowest I saw was -26 F, and the average for December through January was probably around 10F.) It was freeze-your-water-trough-through-and-through-then-cover-it-in-two-feet-of-snow cold. I carried 5-gallon buckets (3/4 full let’s be honest) from the kitchen sink out to the (then two) equines multiple times daily. We now have twice as many equines. It is something I do not wish to re-live. The other big pre-winter chore is buying hay, which we find challenging owning only a pickup and stock trailer (i.e. no flat bed, no tractor, so large/round bales are out of the question at this point). Last week we got 2.72 tons of grass hay (22 bales in the pick-up bed and 38 in the trailer) and need to make a second trip to get at least that much again. putting up temporary walls on the run-in to keep the snow from piling up inside and creating a frozen/muddy mess. Yes, mustang, I too feel like the windows are small and useless. However the structure of the run-in is warped from several years of cattle poo piling up inside and other abuse/neglect, so it’s a larger project than just the . If we rent an excavator for the waterer installation we may make some headway there. We’re off to a clinic with the mustang’s OG trainer this weekend, and hoo boy, before you know it it will be Thanksgiving again and I sure hope some of these items are checked off the list before the snow flies. Categories: Goals and Milestones, Ranch Diary | Permalink. On July 30, we celebrated one year together. In the dog adoption world, this milestone is referred to as a “Gotcha Day,” and often celebrated in lieu of a birthday because no one knows when most rescues were born. Same goes for mustangs. Probably never saw grass this tall in Nevada. We didn’t do any special treats or long rides. I had planned to compose an Instagram or Facebook post that declared all that this year had done for and meant to me, but the day slipped away, as days do. So here I am a couple weeks later, staring out the window at the snorting beast, who, for the last few months has done little I can complain about. A few days ago we had friends in town with two toddlers. 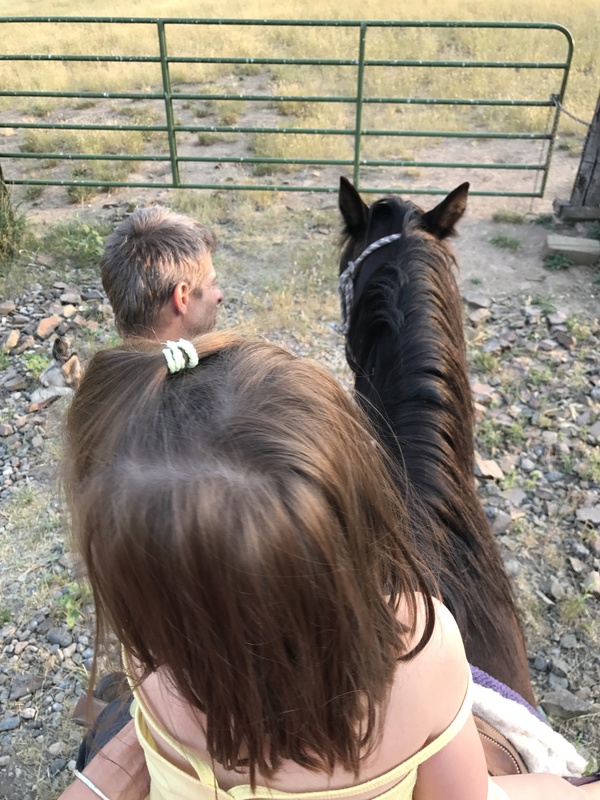 The older of them wanted to go for a ride, and I chose the mustang over the 34 year-old horse and the 12-hand donkey when it was time to consider who was safest. He carried the two of us all over the property without stepping a foot wrong. I tried not to cry from the overwhelming pride. This is a formerly wild mustang with a 3 and a half year old child riding him. NBD. Things changed a year ago when I brought home this horse. First I got giddy and just wanted to hug and kiss him like a child. Then that all led to getting a panel slammed into my face and dismounting in fear when it felt like respect was non-existent and bucks were imminent. 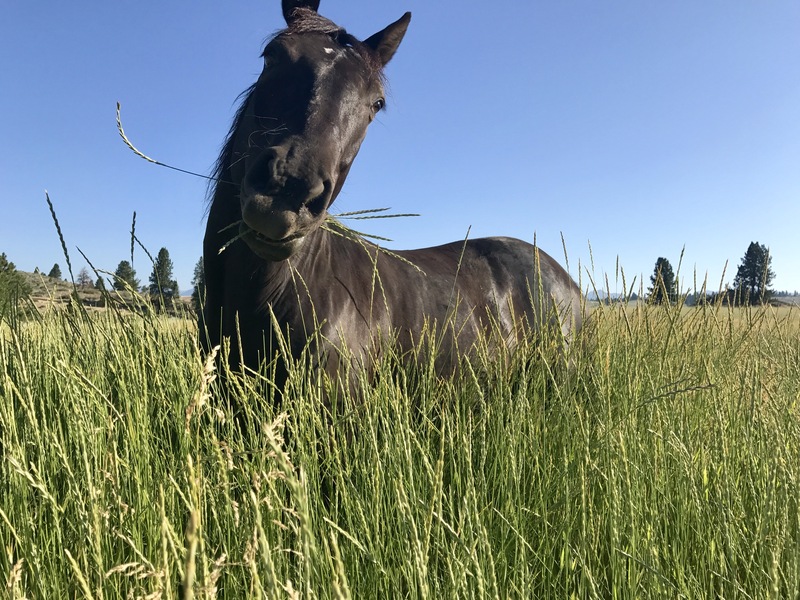 Finally I sought out help from the wise horsemen before me (in person and via the internet) and began to grow and bond with the portly, formerly wild dude by treating him like a horse instead of a human or a dog. I learned very quickly how to slow down and be more observant, to seek consistency and clear communication and to above all be fair to him. I stopped telling him what to do and started asking. I made the wrong thing hard and the right thing easy. My whole notion of horsemanship got turned on its head, and with it came many necessary lessons about not just horses, but life. I began referring to him as my zen master, my BLM black buddha. We have a long way to go. 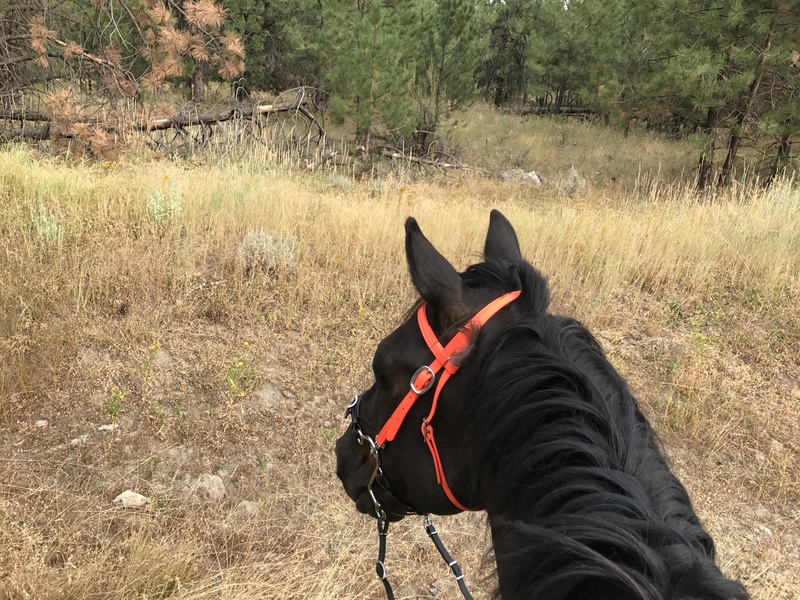 He’s not a fine-tuned arena horse and our list of goals for getting out on the trails together is long enough that we’ll be working at it for years to come. But I’m grateful for the year we’ve got under our belt, and excited for the ones ahead.